A deceptively spacious four bedroom Victorian town house which offers wonderful flexible accommodation and is ideally suited in the heart of the conservation area offering easy access to all amenities. The property is set over four floors and benefits from five reception areas, of which two can easily be used as further bedrooms, first floor bathroom and ground floor shower room, gas central heating and an enclosed South Westerly facing garden. Double glazed window to front. Open fireplace with quarry tiled hearth and wooden mantle over, opening to kitchen/dining room. Fitted with a range of both floor and wall mounted units with wooden work surface over, butler sink with mixer tap, cooker point with extractor fan over, integrated dishwasher, fridge and freezer, radiator. Double glazed double doors to side and two double glazed Velux windows. Stairs to first floor and basement rooms, door to inner hall. Double glazed stable door to garden, double glazed sash window to front. Radiator, two wall light points, doors to shower room, family room/bedroom four and study. Tiled shower cubicle, low level w.c. wash hand basin, part tiled walls, tiled floor, plumbing for automatic washing machine. Double glazed velux window. Double glazed velux window. Radiator. Double glazed sash window to side and double glazed velux window. Radiator. 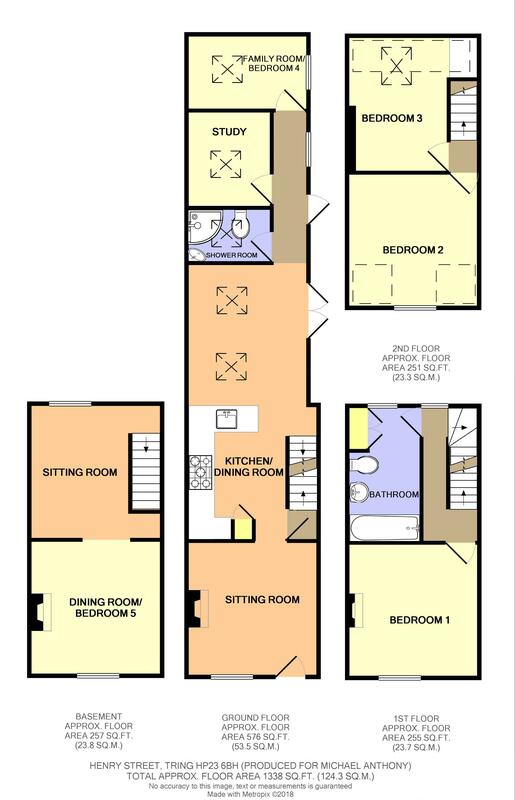 Currently divided into two separate areas, a sitting room and a dining room/bedroom five. Radiator, two wall light points, opening to bedroom area. Double glazed window to front. Radiator, brick built fireplace, wall light point. Double glazed window to rear. Radiator, stairs to second floor landing. Double glazed window to front. Radiator, feature cast iron fireplace. Comprising panelled bath, pedestal wash hand basin, low level w.c part tiled walls, radiator, airing cupboard housing gas combination boiler. Double glazed window. Doors to bedrooms two and three. Double glazed velux window to rear. Radiator, built in wardrobes, access to loft space. A small enclosed garden with pathway to front. A south westerly facing garden which is mainly laid to lawn with brick and shingled patio areas, all enclosed by walling and panel fencing, gated access to front, outside lighting and cold water tap.